When the Walker Stalker convention initially announced that they would be brining in non-zombie related guests, I was skeptical. 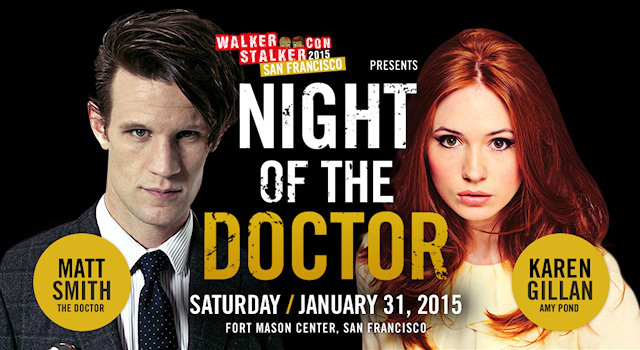 That is, until they announced that Karen Gillan, Arthur Darvill and Matt Smith of Doctor Who would be attending the San Francisco leg of the con. I immediately cancelled a burlesque performance in Seattle, booked myself a flight, a room at a hostel within walking distance of the Fort Mason center and a VIP pass to the con. If you haven’t guessed, I am a Whovian. A brief history on that, because without it, I don’t think you will quite understand my sheer joy at attending this convention. About 5 years ago, my nerd friends kept insisting that I watch “Doctor Who,” because I liked Harry Potter and David Tennant was the Doctor and whatever. I am very much like John Locke in the sense that I don’t like being told what to do, so I didn’t watch the show out of spite. Fast forward to a couple years later and I was going through a very difficult time in my personal life. I had a LOT of time on my hands so I decided that I might as well see what all the hubbub was about. I was hooked from the very first episode with Eccleston. I had to take a two week break after Tennant’s regeneration, because I could’t imagine anyone else helming the TARDIS. Finally, I felt emotionally prepared to continue watching. Matt Smith popped up on my screen, and while he wasn’t David Tennant, he was very much the Doctor. I remember my first thought upon seeing him, and it’s important to this piece, was “that guy has a face that looks like he would be fun to build a fort with. I wanna build a fort with that guy someday!” Don’t ask me to explain it. I can’t. Cue to my life as a Whovian; where I have been asked to sit on panels about the show at other conventions, I am the trivia host at a bar called the TARDIS Room, and I have a Doctor Who tattoo sleeve. Now that we’ve covered that, I can carry on knowing full well you grasp just how stoked I was for this con. I live in Portland, Oregon, meaning I woke up before dawn to get ready and go to the airport. My insomnia had been a real pain, so I was running on the fumes of multiple energy drinks, wishes and starlight when I boarded my flight to San Francisco. When I arrived a little over an hour later, my adrenaline shot through the roof and I couldn’t sit still. 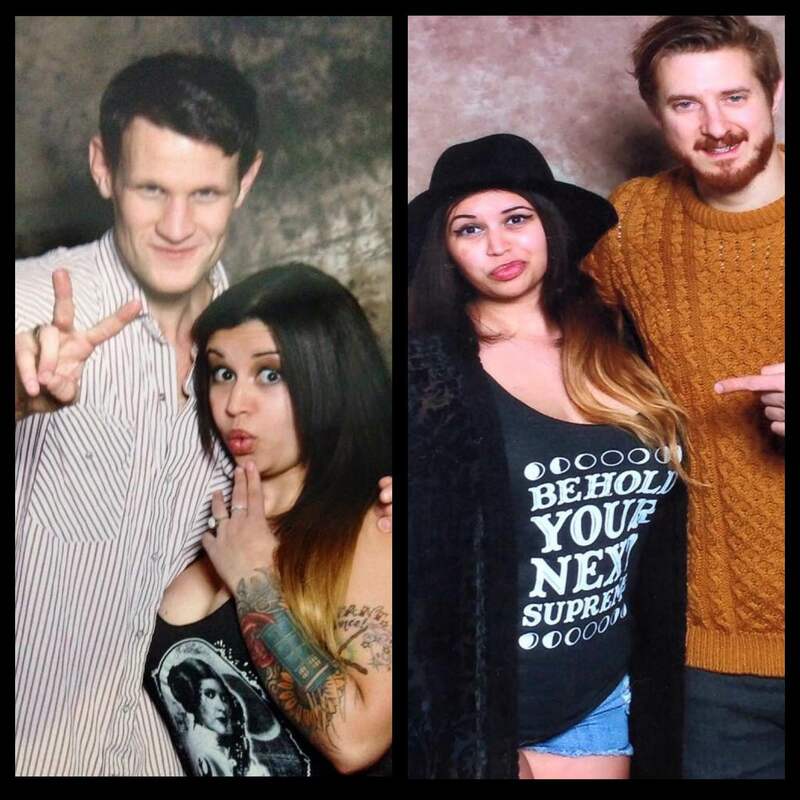 I was on my way to meet Matt Smith and ask if he wanted to build a fort with me. I’ve been saying for years that I would ask if I ever met him, so I had the opportunity and I was absolutely going to take it. I was a little surprised when I made the precarious trip down what I dubbed the “Exorcist-y stairs,” from my hostel to the Fort Mason center - there were SO many people! As a fairly regular con-goer, I was extremely anxious about the crowd. Usually it means long waits in lines everywhere, cranky people and flustered staff/volunteers that aren’t always helpful. However, when I finally reached the bottom of the stairs, the volunteer greeted me with a smile and pointed me in the direction of badge pick-up. There was no line and I was able to enter the main hall with no issue. Even when the con opened to the general admission crowd, there was no shoving, no being herded like cattle... I was really impressed by how smoothly everything ran. After wandering around the main area and saying hello to some of my friends from The Walking Dead (yes I have them, but I shan’t name drop) I made my way to the building where photo-ops were being held. Despite the crowd, the lines moved quickly and no one was rude. Matt Smith was running a little late from his autograph signing, but there was only about a 5 minute delay and he popped up over the curtain and apologized for his tardiness. Hello sir, could you be any more English? I love it. It was finally my turn for a photo. I knew I wouldn’t have a chance to ask about the fort, so I just got a quick hug, posed and went to pick up my photo. I honestly don’t remember what I did with my face, but no big deal. I just hugged Matt Smith and he smells awesome. I don’t care if you weren’t curious, now you know. After the photo-op was over, I had some time to kill before “The Fortening,” so I went back to the hostel to try and take a quick nap. Yeah, I couldn’t stop shaking, so that didn’t happen. Curse you nerves and caffeine! The moment had arrived and it was time to get my autograph. I handed him my picture, he signed it and I blurted “So, I have to ask you a question.” He looks up and says “OK, shoot!” I briefly explain my first thoughts of him and then ask if he wants to build a fort with me. Puzzled, he repeats “A fort?” I confirm and he laughs. “Where are we gonna get the stuff from? Where are we gonna do this?” I had not thought this far ahead in the plan, so I just shrugged and said I didn’t know. He laughed again and said, “Ya know what? Yeah. You get the supplies and find a place and time and we’ll do it. Yeah, let’s do it!” Then there was a (contractually/legally binding) fist bump and I moonwalked back to my hostel while doing the Judd Nelson/Breakfast Club victory fist raise. Then I finally took a nap. Once I was refreshed, I made my way to the special “Night of the Doctor” panel with Smith, Darvill and Gillan. It was PACKED. The three of them were a riot on stage together, taking time to poke fun at one another and even do a brief rendition of Queen’s “Bohemian Rhapsody.” My only issue with the panel is that the building it was in looked like an airport hangar, which made it very echo-y and hard to hear what was being said, but all in all it was an amazing time. Post “Night of the Doctor,” I met up with Lisa and Katie of the Horror Honeys. Shenanigans o’clock! These ladies were an absolute delight and we had an amazing time wandering San Francisco after dark, and chatting with some of the cast members of The Walking Dead. We parted ways and I fell asleep at 4am, ready to get up and con the next day, for that was the day I was to meet Arthur Darvill. Hanging with The Honeys! Sci Fi Honey Katie and Horror TV Honey Lisa. In the morning, I met up with my friend Kyle (aka cosplayer Captain Kyle) and waited in line with him while he gathered his autographs from Karen Gillan and Arthur Darvill. I said a quick hello to my Scottish/Amazonian princess (she is my lady crush) and then wandered to the next table to say hello to Rory the Roman himself, Arthur Darvill. After Kyle received his autograph, we were walking away when I was called back to the table by Arthur. He apologized (so British!) and said that he just wanted to look at my tattoo close up. Happily, I obliged, and he told me that he loved it. After that awesome moment in my life, I went to my photo-op with Mr. Darvill full of joy and dressed like Stevie Nicks because she is my spirit animal and I do what I want. Again, everything moved smoothly and it was back to the hall for my very own autograph with him. I had read somewhere on the internet once that Arthur collected taxidermy. I do as well, so I decided to ask him about it. Turns out that he does, but a lot of his pieces were destroyed by moths. We chatted about taxidermy for a second when his attention was captured by a ring that I am rarely seen without. It is a rose gold ring with a becavitied human tooth in the center. “That’s really cool! A little creepy, but definitely cool.” I don’t think he realized it, but Arthur Darvill perfectly summed me up in that moment. We continued talking about my collection of human teeth at home, I have a jar, when he looks at the little girl behind me and laughs. “You look REALLY freaked out right now!” With that, I said my goodbye to him and walked away. The weekend had drawn to a close, and though I was absolutely exhausted, I was beaming. I have never experienced such an amazing con and can’t wait to attend another Walker Stalker! I hugged all of my friends, both old and new, goodbye and made my way to the airport. As I sat in the Cat Cora restaurant near my gate, sipping my wine and ignoring the outrage from the Super Bowl results, I beamed. The weekend was such a blur of an absolutely surreal, amazing time and I couldn’t be happier that I decided to go. But mostly, I’m looking forward to seeing Matt Smith again so we can finally build that fort. Huge zombie lover and Whovian, Nowal “ZeeGee” Massari is a native Portlander, Burlesque performer, SFX makeup artist, paranormal investigator, trivia hostess, con-panelist, horror/pop culture expert and writer for Paranormal Pop Culture and Living Dead Magazine. Connect on Twitter!